Pompeo, who flew to Seoul after the summit, said the brief, four-point joint statement that emerged from the summit did not encapsulate all the progress the U.S. and North Korea had made. He said negotiations would recommence "in the next week or so." It was left to Pompeo, who has twice visited Pyongang, to explain the summit's outcome to anxious U.S. treaty allies South Korea and Japan. 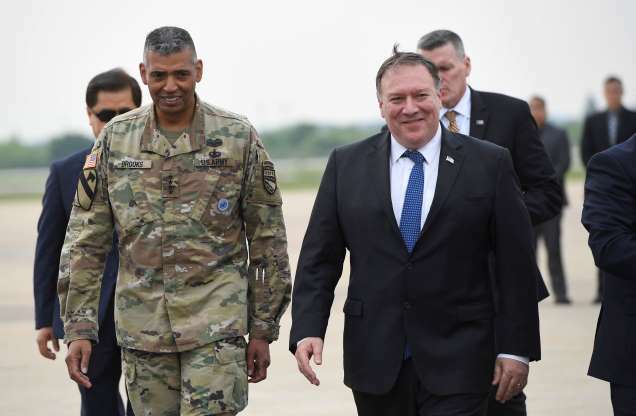 In the South Korean capital, Pompeo and the foreign ministers from both countries joined for a three-way meeting, ignoring a shouted question from a journalist about concerns over the halt in military exercises. In public, at least, South Korea's leader sought to put a positive spin on the summit's outcome. Meeting briefly with Pompeo on Thursday morning, Moon said he was eager to hear how the United States and North Korea could "fully and expeditiously implement this great agreement" in the coming days. Lederman reported from Seoul, South Korea. Anne Flaherty and Noreen Nasir in Washington, Foster Klug and Adam Schreck in Singapore, Eric Talmadge in Pyongyang, Kim Tong-hyung in Seoul and Mari Yamaguchi in Tokyo contributed. World - U.S. Daily News: Trump claim raises eyebrows: NKorea no longer a nuke threat?